In siding with neither his fellow conservatives, nor the more liberal members of the Supreme Court in his opinion upholding the a key element of the affordable Care Act, Chief Justice John Roberts took aim at one of the two most problematic parts of the U.S. Constitutional as viewed by contemporary conservatives. That ominous, deciding opinion belies a faith in the world view of one Mr. Herbert Spencer. For all but the most aged Americans, that view as interpreted by the Supreme Court hasn’t received much respect since about 1937, but that could all change. Decades before the New Deal, the relatively new 14th Amendment was at the heart of several early attempts to reconcile the Constitution with the social and economic realities of a country so radically changed by the Civil War. 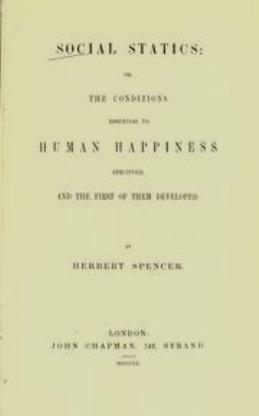 By the turn of the 20th Century, an emerging school of thought concerning the very nature of those recent changes came into conflict with the dominant view of the time, shaped in part by the man-made concept of “survival of the fittest,” a term coined by Herbert Spencer. The analogy exists of the man stranded in the desert choosing who is offered a drink of water, but only in exchange for accepting terms that would otherwise be recognized as unreasonable, if not unfair. In 1905, a majority of Supreme Court justices found such a choice to be, however regrettable, an intrinsic part of man’s natural condition, with the desiccated man having only to accept a drink of water – or not. Other factors were irrelevant. In that year, the Supreme Court articulated a concept supporting such choices, in particular when applied to labor as Liberty of Contract – inviolable regardless of circumstance. 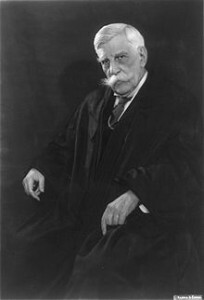 That matter was Lochner v. New York, better known today not for its majority ruling, but for its famous dissent by Associate Justice Oliver Wendell Holmes, Jr.
Lochner, despite it playing no part whatsoever in the deliberations over the constitutionality of the Patient Protection and Affordable Care Act Cases, is illustrative of this blog’s theme, history as prologue. Both matters involve ideological conflict and the just weighing of competing rights. Efforts by individual states to regulate labor matters, legislation that defined the beginning of the Progressive Era, were ultimately struck down by the Supreme Court. A court majority accepted, as was the case in Lochner, that a liberty of contract was inherent in the 14th Amendment, essentially making no distinction between the nearly unlimited power of business combinations and that of the individual working person. Once again, the acceptance prevailed of Spencer’s philosophy in which economic winners and losers were a matter of natural selection, not revolutionary changes in a budding world economy. In the minority until the final years of his long tenure on the Supreme Court, Holmes rejected the viewpoint that a worker and a business shared equal footings when it came to negotiating wages, working conditions and fair treatment. He reasoned that, in the time of our nation’s first combinations – many of which were later recognized as monopolies – a worker who resided in a town essentially owned by an industry behemoth had few options to earn a living but from the company. As such, Holmes issued his challenge to the logic behind the prevailing world view of the court in the form of his famous, dissenting opinion in Lochner. By 1937, only after the retirement of several of the court’s anti-New Deal justices did the realist view of Holmes finally become widely recognized by the Supreme Court. From that point, the Commerce Clause, the unmistakable target of Chief Justice Roberts’ opinion, joined the 14th Amendment as an additional constitutional mechanism by which Congress could legislate to reflect contemporary economic reality. While all of us experienced the economic catastrophe of 2008; none of us were alive for the Panic of 1893, viewed by many as second only in severity to The Great Depression. Both stemmed from the identical adherence to a militantly anti-regulatory faith. Both disasters were and continue to be followed by strident denials of the role such faith played in creating the crashes. It is an unfortunate tendency that we in society adopt the morally lazy notion that our historic experiences with economic inequality, centuries of systemic segregation and shameful indifference towards human and civil rights has somehow been relegated to tiny, powerless, backwoods pockets of ignorance. We justify this view by doubting that, in 2012, the discredited belief in Social Darwinism can play any significant role in a modern, democratic government. It’s as if The Bell Curve was never written or that the Tea Party never rose to equal in political influence the Know-Nothings. Today, a majority of American citizens were born after the enactment of the 1964 Civil Rights and 1965 Voting Rights Acts. 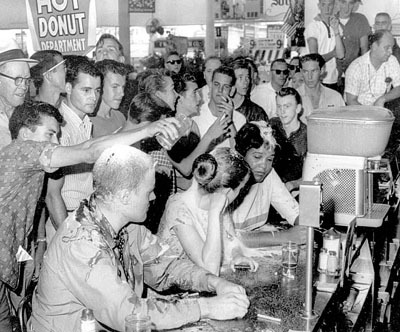 Members of that same majority never sat at a segregated lunch counter. What many among this present majority may also not know is how the Commerce Clause – that third part of the eighth section of the first article of the Constitution – helped end a society that once embraced as “natural” the philosophy of Herbert Spencer. Despite the hysterical fears of many, Congress applied the Commerce Clause in righting some shameful wrongs without ever once forcing a citizen to eat a single floret of broccoli.